And I’m not just talking about some no name knock-offs either. 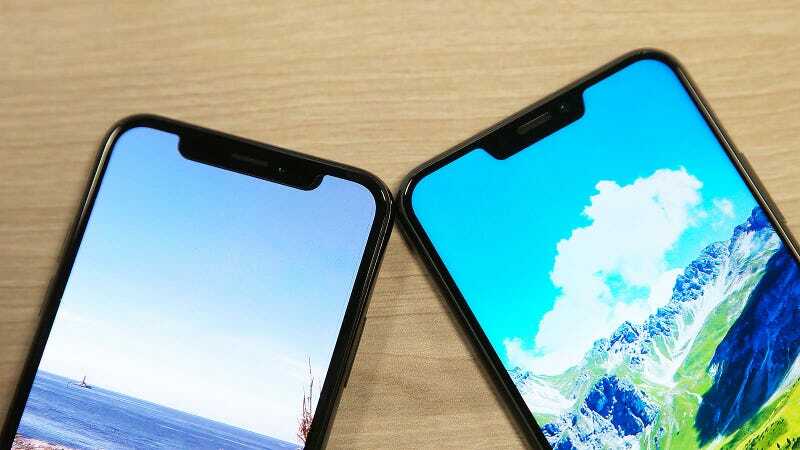 On the Zenfone 5, not only did Asus rip off the iPhone X’s notch, the company blatantly copied the rest of the X’s design too. Then there’s the R15 made by Oppo, the fifth largest smartphone maker in the world. Even LG reportedly showed off a notched G7 behind closed doors, and that’s before we talk about all the other notched Euro and Asian smartphones we don’t pay attention to here in the US. And with rumors that Huawei and OnePlus are adding notches to their next handsets, pretty soon it’s going to be only Pixels, Galaxys and maybe a Moto that still have unblemished rectangular displays. So the whole world has gone notch crazy. Sweet. Now there’s a couple reactions you can have. One is to get angry about it, which is fine, but instead, why not try to look one level deeper and figure out what’s causing this change? With the recent trend of smartphones opting for full-view or extra-wide or whatever you want to call it displays and cutting down on bezels, the notch was really an inevitable evolution. Here’s another phone not mentioned in the tweet above, the View 2 Pro from Wiko. You can’t really get rid of a phone’s front-facing cam without whipping up the hoard of selfie-snapping fanatics into a frothy social media-powered complaint storm. But you can try to recover the space on either side of a phone’s front sensors, which is precisely the line of thought that gave us notches in the first place. And while the Zefone 5’s notch is quite uninspired, you got to give Asus a little credit for delivering a handset with a screen-to-body ratio of 90 percent, which is better than both the iPhone X (82.9) and the Galaxy S9 (83.6 percent). When you realize this, suddenly it seems kind of silly to get worked up about Android phone makers copying the iPhone X’s notch. The notch wasn’t even the iPhone X’s to claim in the first place. Additionally, conflating the inclusion of a notch with phone makers copying Apple seems a bit flawed. Here’s another shot of the of the Ulefone T2 Pro. Are you sick of notches yet? The iPhone X is much more than a handset with a screen that has a crooked side. That notch is hiding some pretty impressive facial recognition tech, that try as they might, has to be replicated on any Android phone. The iPhone X also has a build quality that is largely unmatched outside of a select few Android phone makers, and its homegrown processor still blows Qualcomm’s chips out of the water when it comes to pure speed. Yes, the Zenfone 5 is an iPhone X clone, but that’s because it copied Apple’s entire playbook. Most other smartphones makers are simply chasing the easiest path to bigger, more immersive displays. So now back to the issue of coolness. When you think about it, the notch is really a utilitarian compromise, and as everyone knows, utility is the opposite of style. Consider the good ‘ole utilikilt. (Please click that link if you want a good laugh.) Its open bottom gives you plenty of mobility, and its rugged cotton-poly blend and metal grommets are surely quite durable. But is it cool? Hell no. Clearly, this is the height of sartorial elegance. Or what about the suburb’s favorite people mover, the minivan. It’s by far the best way to shuttle a gaggle of rambunctious children to a soccer game or ferry a pack of labradoodles to the vet. But there’s a reason why when people have mid-life crises, they opt for a sleek two-seater rather than a wood-paneled Caravan. No, if smartphone makers were going for cool, they would have tried harder. Maybe if they ask real nice, Vivo might give them some tips. So until someone figures out something better, notches are going to be a standard feature from here on out. And that’s really the issue at heart, because not long after Essential and Apple made notches neat, everyone else hopped on the bandwagon and ruined it. After all, there are few things worse than running into someone and realizing you are wearing the same clothes. What a bummer.